No, dear reader. That headline is not hyperbole. It’s based on official Bank Of International Settlements data. While everyone was focused on the impending European collapse, the latest soon to be refuted rumors of a quick fix from the Welt am Sonntag notwithstanding, the Bank of International Settlements reported a number that quietly slipped through the cracks of the broader media. Which is paradoxical because it is the biggest ever reported in the financial world: the number in question is $707,568,901,000,000 and represents the latest total amount of all notional Over The Counter (read unregulated) outstanding derivatives reported by the world’s financial institutions to the BIS for its semi-annual OTC derivatives report titled “OTC derivatives market activity in the first half of 2011.” Indicatively, global GDP is about $63 trillion if one can trust any numbers released by modern governments. Said otherwise, for the six month period ended June 30, 2011, the total number of outstanding derivatives surged past the previous all time high of $673 trillion from June 2008, and is now firmly in 7-handle territory: the synthetic credit bubble has now been blown to a new all time high. Another way of looking at the data is that one of the key contributors to global growth and prosperity in the past 10 years was an increase in total derivatives from just under $100 trillion to $708 trillion in exactly one decade. And soon we have to pay the mean reversion price. Which brings us to the chart showing total outstanding notional derivatives by 6 month period below. The shaded area is what that the BIS, the bank regulators, and the OCC urgently hope that the general public promptly forgets about and brushes under the carpet. Try not to laugh. Or cry. Or gloss over, because when it comes to visualizing $708 trillion most really are incapable of doing so. What is the Aussie bank(ster)ing system’s share of that total? According to the RBA, at June 30 2011 our banks held … wait for it … $16.97 Trillion in “Consolidated Off-Balance Sheet Business”. An all-time record total. And a record increase of $2.14 Trillion in just 6 months. 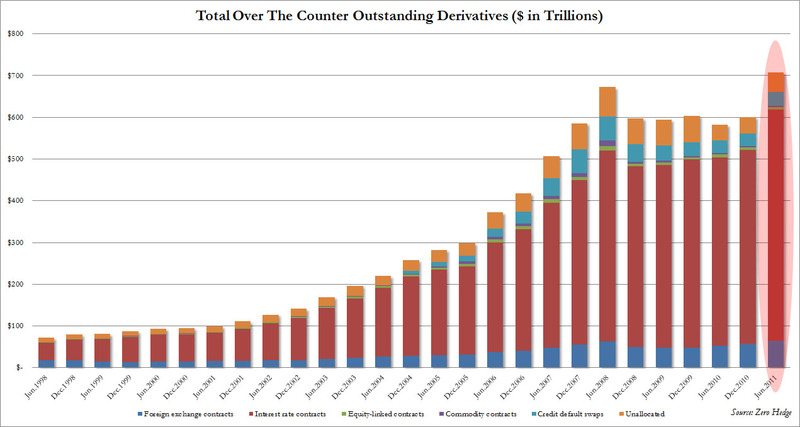 Including almost $9 Trillion in OTC derivatives bets on Interest rates. And $2.2 Trillion in OTC bets on Foreign Exchange rates. Can you say “galactic-scale casino”? Seems our little Milky Way galaxy just isn’t big enough for our bank(st)er ‘masters of the universe’. Because the dream of global carbon dioxide derivatives trading has always promised an intergalactic expansion of Big Bang proportions. As your humble blogger has argued for so long, our Green-Labor government is playing their part in the banksters’ dream. Despite being presented as a “tax” for the first three years, the truth is that derivatives trading is the real goal of a scheme purportedly designed, and certainly fronted, by Trilateralist “economist” Ross Garnaut. 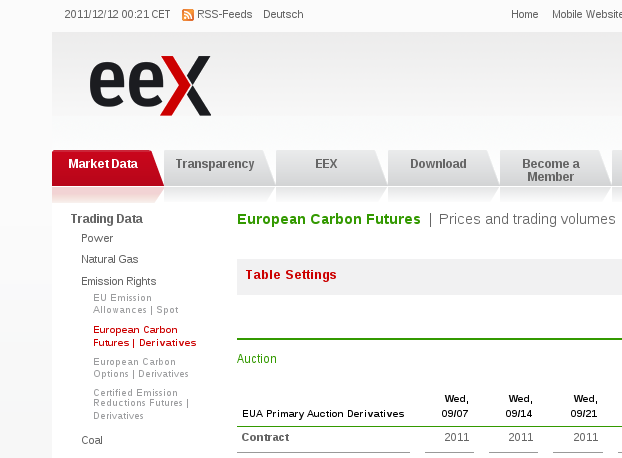 A new form of wholly unregulated derivatives trading that will begin from Day 1 … before the so-called “fixed price” period ends, and the “ETS” begins. Here’s a Bloomberg news article I missed back in November, reporting on an ASX announcement that adds further proof to that already presented in previous posts. ASX Group, operator of Australia’s main stock exchange, plans to offer secondary and futures markets for carbon allowances before the country’s emission trading system begins in 2015, the exchange said. For more, see my earlier article “Ticking Time Bomb Hidden In The Carbon Tax”. $707 trillion!? That’s a lot of ‘money’ – not. 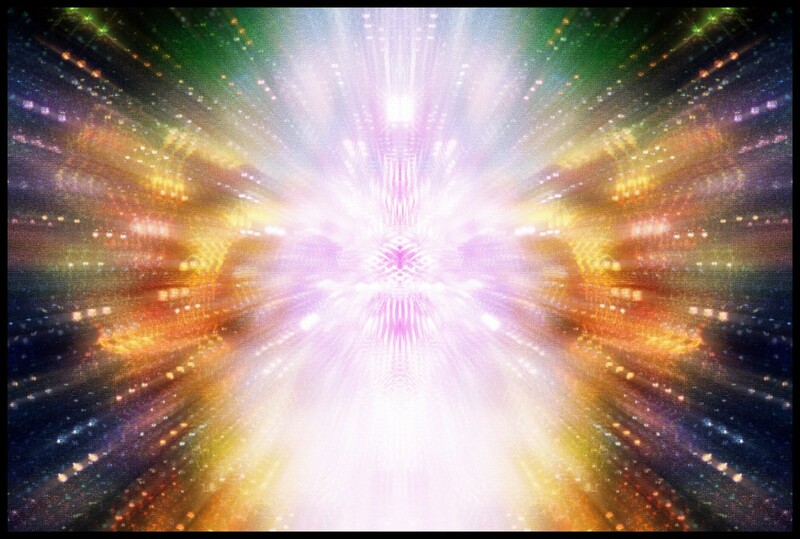 Watch the ‘money’ vanish because it was never money in the first place but bad debt. Doug Noland has mentioned this before & quite logically compared it with the Great Depression. The Great Depression was a crisis of money, a time where what was once thought, & traded as (that is, demanded in infinite quantity, you can never have enough), money, was found to be debt of dubious or no quality & so lost its bid – much like $707 trillion in financial derivatives, hence the vanishing act. When it comes to debt QUALITY is the key to value. Government debt is well past repayable & so has no quality, yet it is the supposed ‘bedrock’ of the modern global monetary system. How long can the governments & their central banks keep the music playing? Mr Noland thinks time is running short. Agree with all, JMD. Well stated. A couple of amendments to my comments. I should have added at the end of my second paragraph – Hence the often quoted, “There was a lack of money during the Great Depression”, this is, in a sense, true, it was just that what was thought ‘money’ during the ‘roaring twenties’, wasn’t. The ‘moneyness’ of debt! And also – Doug Noland thinks time is running short & he may be right, he is far more knowledgeable on this than I but thinking objectively, the debt of government has had no quality since the Great Depression, yet here we are. I’m reluctant to say the can cannot be kicked further. Mate, your article is equivalent to saying “Shock statistics show there are 700 trillion megawatts of electricity in the world, waiting to kill you”. The total notional of OTC products in the world is no different from saying there’s 28 zillion gallons of water in the sea – what you need to know, is the actual amount of money at risk by a specific bank, which is measured quite differently, and in much smaller numbers than the 700 trillion. When you take the trades done by an individual firm, and check what each is worth on any given day, and add it all up, the numbers are much lower. But even that isn’t realistic, as you need to know which of the banks counter parties might not pay – and then you have an even smaller number which might represent an actual loss to the bank. Bill, with respect your analogy is patently false. And thus, the base premise for your rebuttal fails. Unless, that is, you can explain how exactly there is counterparty risk involved in the existence of electricity, and/or seawater. By your own words, you make my argument for me by highlighting a key danger of OTC derivatives – they’re “black” (unregulated), and self-reported, thus total opacity regarding true quantum, linkages, and counterparty risk. In the second half of my comments I point out that calculating the actual net risk to each firm in the OTC market is more complex than adding up the notionals. Credit risk needs to be incorporated to get a better understanding of how a firm is exposed. I am not claiming notionals are a zero sum – but I am wanting to move beyond using huge numbers as scary things in their own right. Hence the water analogy. Whilst the general direction of the new regulations is to capture all the OTC trades in ‘repositories’, and make greater user of central clearing – the regulators have yet to figure out how to make a true assessment of a firms financial health, taking into account OTC exposure and credit risk, plus their positions in Repos, FX, Stock Loan, Commercial Lending, and Exchange Traded products. 2. The suggestion that the entire OTC market is a “time bomb” suggest somehow all the firms in the world who’ve ever traded an OTC contract, including corporates and pension funds, are all going to collapse in one single implosion – which is an unlikely probability. The more worrying issue for the world right now is whether governments (including the UK) can successfully pay back their bond debts, down to a level where they can sustain the interest payments. How about a follow up article on the government bond market? the headline would be “$83 trillion government debt time bomb”. Once again Bill, by your pointedly failing (again) to refute the fact that the OTC market is unregulated and self-reported, thus the quantum and linkages are completely unknown/unverifiable, you have no empirical basis upon which to make this claim. I note from your blog that you appear to derive income from operating in the OTC derivatives sector – with respect, you are doing nothing more than parrot the "standard line". The reality is this: neither you, nor I, nor anyone else, has the first clue of what is the actual exposure at risk, either in total, or in specific case examples. Therefore, I have no problem at all with referring to the entire "notional" edifice as a "time bomb". If you have a problem with that, may I politely suggest that you take your grievance up with Warren Buffet, from whom I’ve adopted the description. In my view, such a headline would not necessarily be far off the mark. Fair enough but how do you expect to calculate credit risk when the “government debt time bomb” blows? Are your counterparties going to pay up then? How do you know the credit risk exposure of the counterparties you’ve hedged your positions with now? The report does say “outstanding derivatives”, I presume it is some aggregate of the outstanding obligations of the financial system. 707 trillion dollars worth of ‘assets’ that are at the same time the liability of someone else. if “government debt time bomb” blows, we’re all in deep doo doo – which is why there’s been lots of charts showing who had lent money to Greece – mainly France and Germany – hence the negotiations going on to solve the European debt crisis. All firms measure their credit risk too all their counter parties during the day as they put on new trades. The assumption up until now was that governments didn’t default on their debts, which was disproven by Russia in 1998 causing losses for many banks. If you can’t trust government debt, which is normally AAA rated – it unravels the usual behaviour that investing in governments is safe, and that we can trust them to repay. This underpins pensions funds and all sorts of collateral management. Without AAA government debt – who can you trust? There isn’t any else. The BIS report will always say “outstanding derivatives” and they count them by getting all the banks to report notionals to Basle. These 700 trillion aren’t assets in the real sense, like a car or house worth 700 trillion, they don’t exist as physical things. The notional is the amount on the contract which interest is calculated on, I’ve added a list of examples in a post beneath this one. I’m trying to explain that the 700 figure is an amount of business, not the actual amount of money at risk. Ok Bill, so where are the ‘cash flows’ coming from if the assets don’t exist? They must be on somebodies balance sheet somewhere, probably the central bank, ooops… she’s gonna blow! The value of each contract is indeed the cash flows on each swap, which are discounted back to ‘today’ and netted together to get the present value of the entire sequence of flows. It’s this net present value (NPV) which represents the asset, not the notional. If we knew the NPV of each contract, we could add them all up and work out the total value of the OTC contracts held by a bank, and begin to understand how much money might be at risk. Again, the 700 isn’t the value of these contracts, just the amount of them being done. The banks that carry out OTC business have specific capital rules (from regulators) that relate directly to the amount of OTC business they do, and the types of counter parties they do it with – linking them directly to the Basle regulatory rules. I agree OTCs are self reported, I’m not disputing that. So here’s an example of why the amount of risk isn’t the notional of a contract. Does this help explain why the amount of money at risk isn’t the $100m, but is derived from the difference in interest rates, and therefore much lower? For other OTC contract types, similar calculations take place, which is why despite you repeating the fact that you personally have no knowledge of the net risk in the market, I’m trying to enlighten readers that the failure of one organisation, doesn’t risk the whole notional of the contract. We agree the above rate swap. Some time later you want you decide you want to remove that swap. One way is to pay a termination fee, and you’re done. Another is to put on a reverse swap, the opposite of the above. Given the time difference between the dates on which we agree each swap, there maybe an additional amount of interest on the later swap, making the variable sides not equal. In which case there will again be a small difference in rates, lets say 0.5% on which one of us would lose. Even then, the amount of money at risk is small, compared to the total notional of $100m. And what is also important is that in Example 2, the total notional would then be $200m, as there is two swaps. This is why your argument is thin – counting notional is just the amount of swaps being done, not the actual amount of money being paid or received on each contract. The buffet quote is years old, the story goes that he bought a portfolio of OTC contracts included in the purchase of General Re, an insurance company. The previous traders at Gen Re had done a poor job of managing the risk on their OTC portfolio, and Warren Buffet asked the banks to allow him to terminate the contracts. They quoted a market price to tear them up which he didn’t like, and then went on the offensive with his often repeated “weapons of mass destruction” quote. Corporates, and pensions funds, make full use of OTC products to achieve their financial goals, including making widgets which we buy, and enhancing our pension funds to remove rate risk, or avoid inflation effects. Banning electricity would be the same approach – used wisely electricity is very useful, but banning the whole electricity supply because someone jammed their hand in a toaster, isn’t reasonable. Same thing for your article, being anti-derivatives, misses the good uses that many firms put them too. I am not here to defend CDOs, which were a contributor to the fall of Lehman, and not defend the excesses of banks, but to “not throw out the baby with the bath water”. This is interesting debat Barnaby, best wishes, Bill. debate, missed the E, sorry. I realise you aren’t actually Barnaby, sorry, but I can’t find your name anywhere. Bill. Bill your argument here is flawed as you’re not looking at the comprehensive picture of a default. What you essentially have playing out in the word markets today are glorified Ponzi schemes, where debt has become the collateral for even more debt and so the cycle goes on. The problem is that it all needs to be funded from somewhere and so you wind up ripping the guts out of your physical economy to pay for it. In turn, your wealth shifts out of the physical markets into the speculative markets, while deregulating your own markets and thus eroding your own sovereignty (take a look at Greece, Italy, and soon Spain if you don’t believe that economics and national sovereignty are linked). Eventually to generate the revenue needed to pay back the untenable loans, you decriminalise formerly illegal financial activities to generate new revenue streams. Meanwhile your cash flow and actual collateral for the loan is infintismal, and becoming relatively smaller and smaller with each passing day. In addition because you have no productivity and therefore your currency has next to no physical worth; the problem is further compounded. Now let me show you why your defence here is flawed. Loans are seldom 2 way with 3rd, 4th and 5h players being involved and even in 2 way swaps between countries, you have multiple individual financial entities involved. You have person A defaulting on their 6% loan of $100m because someone defaulted on them. Because person A had no capital even remotely capable of realistically paying back the loan, that $100m is effectively lost. The problem is though that the only reason person B ever had that to begin with is because they borrowed from person C so person B is wiped out along with person C.
The problem though is that in reality, these people are banks and under current financial regulations, they take everyone who has a home loan and a savings account with them because laws protecting the man on the street from this either don’t exist or have been repealed. Glass Stegall is a prime example of this in the states. Yet Congress over there keeps repealing it, and in Australia, every elected political party out there, including the Nationals, refuses to introduce its equivalent here in Australia, the Homeowners and Banking Protection Bill for tabling and discussion during Parliament. Your notions of economics remind me of the global warming swindle where so called “experts” tried to argue that global warming – sorry, climate change – was man made due an argument that our Sun is completely and constantly stable (clearly said experts have never taken a class in nuclear physics). You claim to not want to throw baby out with the bathwater, but in this case your whole argument has been anything but that. Considering your defence of derivitives, I cannot wonder if you’re also one of those who claim that “NOONE” saw the GFC coming (which we’re still in the middle of btw). Yes you have a bathtub, but it’s not water that’s inside it, but sulphuric acid and that baby has been so eaten away by it that all that’s left are skeletal remains. I would advise you to research the way physical economics works so you can actually understand the way economics really works in practice. Lend me a fiver will you? Which is a far simpler and more ethical process than what you are defending. You’re talking a mere $5 which is both easily payable more to the point, easily lendable. Neither applies to what you are talking about. In the case of derivatives, you are talking largely in this country at least about mortgage backed securities, where the person who actually holds your mortgage will invariably be very different to the person who has it , because with the invention of mortgage backed securities, your mortgage has actually been turned into the equivalent of shares on the stock exchange. The issue with such large figures and what underpins them is that in the cases of most big banks, it’s the savings and mortgages of ordinary people that are what underpin these largely unpayable loans. Ever wondered why some deposits like cheques take 5 days to clear? It’s because the money is being used in that time to balance the books of the bank depositing it on short term, high interest loans. What you’re defending isn’t borrowing $5 from one person, but borrowing multiples of “$5” from millions of people which you then use as collateral for a loan of billions which you have no way of physically paying back should things go pear shaped. I’m expecting your response here to of course to try and compare the savings and mortgage functions of the banks with the investment banking side of the things; however the two cannot be more divorced from what is needed for the actual physical economy and therefore the nation to prosper. The savings and loans side of things, be it loans for small business and manufacturing or home loans; is a function of the infrastructure side of the money system. These loans are designed to maintain and generate productivity in the case of manufacturing and small business and in the case of home loans, serve as a form of infrastructure. These are completely different to the large scale venture capital projects which don’t serve the nation’s productivity and due to the shift of wealth being taken from the physical economy to the speculative economy; erode the physical economy and ultimately destroy the entire system, as we’re seeing now. Those from your school of thought would argue that because “money” (which in practicality is nothing more than some arbitrary number because it’s based on a loan which is completely untenable) is being brought into the country, that investment must be going on. Of course those from your school of thought did not see the GFC coming, or any other crash over the past 50+ years. The fact that those of us who actually understand the principles of the physical economy either actually did see it coming, or upon learning of them after the fact, could completely understand why it inevitably did occur, should tell you something. I’d question how accurate that figure REALLY is. Last I heard, the total derivatives debts of the world were at the $1.4Q(uadrillion) mark. Maybe it’s 9.3 bazillion. I think this comment stream has run it’s natural course. Wrong. Your $9.3 bazillion comment has no connection to anything in this thread except for some mythical “what-if”. The $1.4Q figure I just brought up was the approximate level of derivatives I was referring to which was held globally as of July 25 2007. Australia’s share of it at that time was roughly $15 trillion. As of June 2008 that figure had shrunk to the $12 trillion mark, however since then, it has shot up to $15 trillion once more. That actually raises 2 interesting questions- is the debt level really $1.4Q and the full scale of it is being hidden, and, if this is the actual figure, how does the rest of the world fare as more and more of the derivatives debts find themselves wiped out? What was that about this comment stream having run its course?